So, as I’ve hinted in previous posts, our Managing Director has left after two and half years of fun and frolics. And who can blame him – he’s only in his mid-thirties, career-focused and in demand. Bigger companies can offer bigger wages. On his leaving day, we all crowded round him while he was gently ribbed about his time here, and later on that evening we crowded round a small bar up the road and bade him farewell. He looked quite excited about the change, telling us about his car and his nice new office in Hemel Hempstead. So, in an idle moment this Monday morning I found his new place of work on the internet. You’ll see an overhead shot of the area. 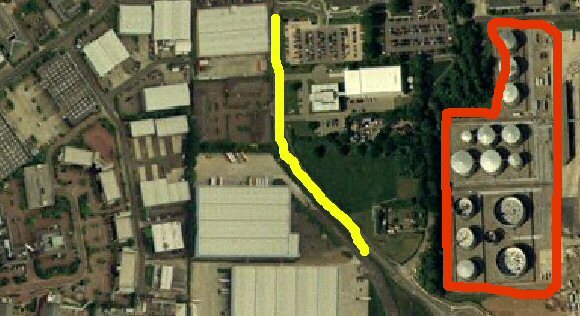 The yellow line is the road the head office is on. Oh, and the red line is where the burning, blown up Buncefield Oil Refinery was, subject of the “largest explosion in peacetime Britain.” last week. Apparently, he is “working from home” at the moment.